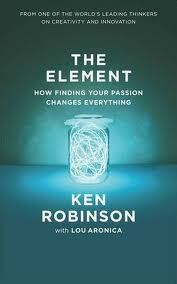 The Element by Ken Robinson | Happy Home Ed. I absolutely loved this book. If you’ve watched Sir Ken Robinson’s TEDTalk, you’ll know why. He’s down to earth, he’s clear, he’s funny. I’d actually marked dozens of pages with sticky notes and I thought I’d copied some of them out, but I can’t find them (it was a library book and it’s gone back). Basically, it’s inspiring and thought-provoking and, again, funny and if you’re at all interested in creativity – not just as it relates to education – you should read it. And then you should watch his TEDTalks. I love this book, too. So much so that I bought a copy to keep and re-read. I’ve never watched his TED talks though, so guess what I’m going to go and do this weekend.